1. A parakeet (meaning “small bird”) makes a great pet for children and parakeets come in an almost limitless number of varieties and colors. 2. If you’re looking for a friendly, peaceful bird with a quiet disposition, then find a conure parrot for sale. 3. Macaws are known for their distinctively bright coloring and are very intelligent and fun-loving birds, but they must be trained. 4. Cockatiels are ideal for those new to owning pet parrots because they are easy-going and never moody or demanding. 5. The moluccan cockatoo is known for being perhaps the cuddliest and lovable type of parrot, but it requires huge amounts of attention and affection. 6. African greys can make great pets, but they are rather high maintenance so be sure to bone up on African grey parrot facts before taking one home. 7. Lovebirds are small and sweet-natured. Just be sure to get two! 8. Budgerigers, also called “budgies,” have sparkly personalities and a knack for entertaining. 9. An eclectus parrot is a great choice for those who don’t mind having a shy, albeit sweet, bird. 10. Amazons come in a variety of colors, are not too loud, and make good cuddlers. 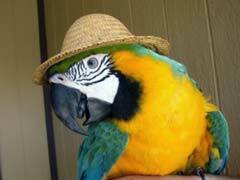 There are many types of pet parrots to choose from, with colors, sizes and personalities to suit most any owner. Just remember your bird’s temperament will have a lot to do with how you raise it. Show your parrot a lot of love and care and it will do the same for you.